Dog men talking dogs and awaiting the return of another competitor. noticeable problem. This was less apparent in the pointing breeds and not detected as early in the retriever breeds. Although I will upset some people here, I believe it is a travesty what has been done to the Labrador in this country, the breed is, by and large, a shadow of what it should be to sportsmen. Some enthusiasts are now importing good working blood from the UK to boost the desire back into Labs, and this can only be a good thing. I have seen some of these dogs run and they are impressive. The Chesapeake never really got off the ground here as most all of the initial imports were completely show bred and their working performance has never really emulated that of their US working cousins. In the spaniel world, working blood was misnamed. Most of our foundation stock for Springer Spaniels had been show dogs and the Springer in New Zealand had been bred from these by hunters to be more of a duck retrieving breed than a flushing breed. The breed here displayed a big dog, capable of bashing through raupo (a heavy native rush) and bringing back a swan, if need be. In many cases, they were slow to cover their ground when hunting game and bore little resemblance to the Springer of England. In fact some were so big and heavy… and slow… you could be forgiven mistaking them for a Clumber. Pigeon trials were the standard in vogue in New Zealand, up until about thirteen years ago. While they are still the most common trial in this country, the majority of our leading handlers have gravitated towards live game trialling… but more of that later. The pigeon trial system of judging is a negative one. A dog starts with a total of points and has to loose them. The standard spaniel course involves hunting over a pre-determined area and finding and flushing a homing pigeon from a release trap with a shot fired - but not at the bird. Early trials had birds shot, but this was eventually outlawed. The next bird on the trial course will be a dead planted bird to be retrieved and then another homer to finish. 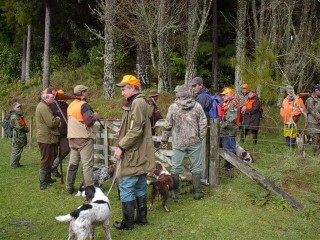 The hunting course usually takes between 20 and 30 minutes to complete and all dogs run over the same ground. They are judged for ranging, steadiness, delivery, etc… as we would expect. The second part of the event involves dead pigeons thrown from launchers to complete a double bird heel retrieve across a waterway - usually a river - in the style of a retrieve event. The dog with the highest aggregate wins the trial.